Camilleri, M. Tabone, S.A. Martinez Villa, D. Krstic, C. Bugeja, C. Antunes Pavlidis, G. Hili, J. Cefai (J. Azzopardi), S.P. Bajada, M. Xerri, D. Bogdanovic. Parnis, F. Apap, J.M. Vella (L. Grima), C. Mercieca (M.J. Bezzina), S. Miloskovic, C. Camilleri (A. Mizzi), J. Pace, J. Bajada, D. Sowatey, E.A. Da Silva, E.P. Lattes. 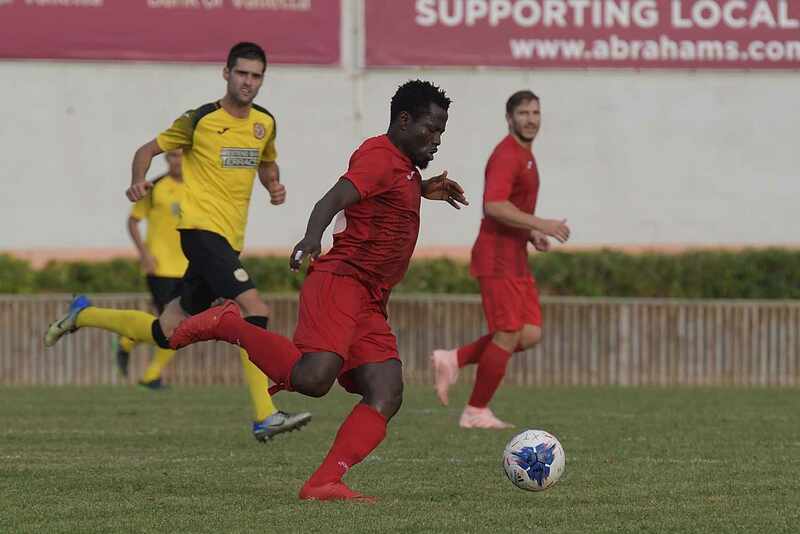 In the main match from Match-Day 5 of the BOV Gozo Football League Division I Xewkija Tigers made up for the disappointing start in the championship and obtained an important win against reigning champions and current leaders on the table Victoria Hotspurs. With this result Xewkija re-opened their chances to live up to the expectations and to be among the challengers for the main honour. Before this match the Hotspurs seemed to dominate the championship as they registered four wins from their first four matches of the league, while Xewkija had an inconsistent start and were trailing the Hotspurs by six points. Thus, this was probably the last opportunity for Xewkija to join the top teams as they could have ended with nine points behind the Hotspurs after five matches of the championship in the case that they conceded a defeat. The Hotspurs started the match as favourites to obtain the second win over Xewkija, as the Citizens defeated their rivals in the final of the Super Cup at the beginning of the season, and the match grew in importance as the Hotspurs could have increased their lead over the second placed team to five points in case that they obtained a victory from this encounter. The match lived up to the expectations and turned out into an well contested encounter where the outcome remained in contention for most of the ninety minutes. 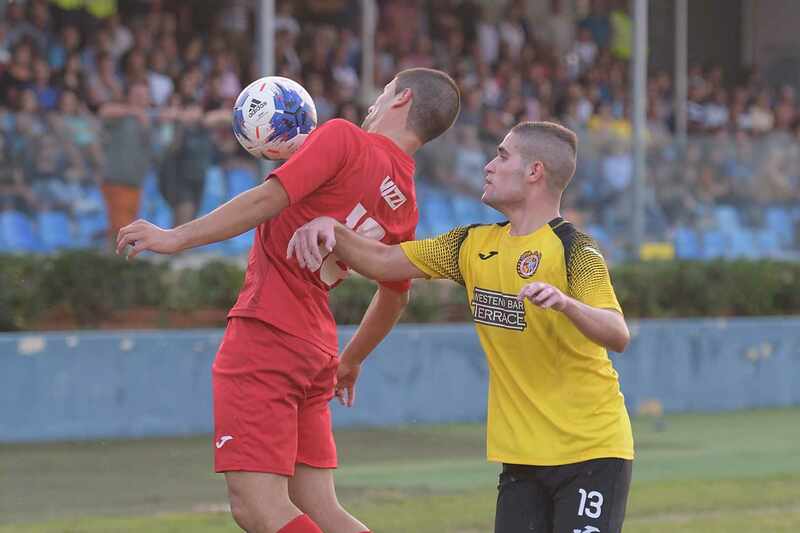 Xewkija managed to produce a match where they were disciplined in their deployment as they made it extremely difficult for Victoria’s striker to conclude towards goal and at the same time they were continuously dangerous with breaks within Victoria’s territory. On the other hand the Hotspurs failed to produce their usual play as they were often erratic in their passing in the midfield, mainly due to Xewkija’s pressing, while striker Elton Da Silva, who scored eleven goals in the previous four matches, did not manage to find a way past Xewkija’s defense. 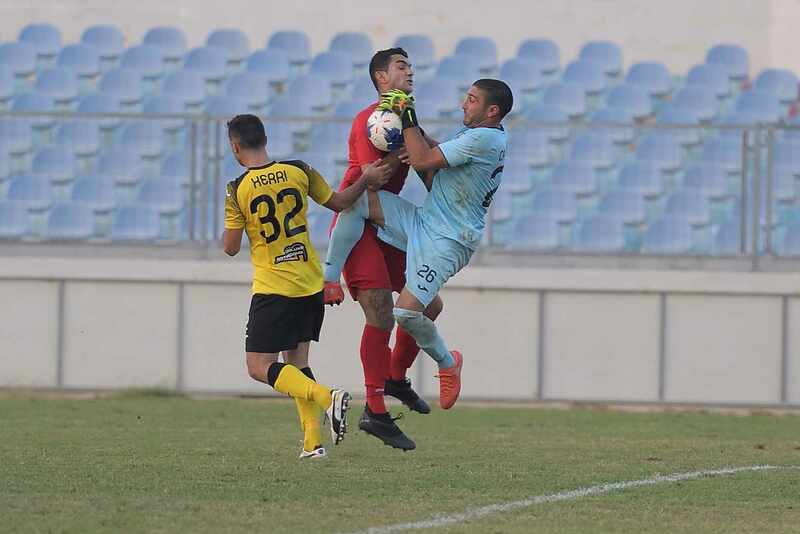 Xewkija came out very aggressive and in the fourth minute of play they were dangerous through a direct free kick by Shaun Bajada that was saved with difficulty by goalie Adrian Parnis and form the rebound Joseph Cefai’s attempt ended wide. On 7 minutes Xewkija had a header by Claudio Antunes that was saved by Victoria’s keeper and the Hotspurs replied one minute later through a shot from outside the area by Emiliano Lattes that was blocked by the defense and from the rebound the same Lattes had his attempt that ended just wide. On 10 minutes Xewkija protested for a penalty when a cross from inside the area by Shaun Bajada was blocked by Victoria’s defense and on 14 minutes a header by Claudio Antunes following a cross by Shaun Bajada ended wide. The Hotspurs replied on 22 minutes through a shot by Elton Da Silva that was saved by goalie Leonard Camilleri and less than a minute later the same goalkeeper was well placed to neutralize an attempt by Stanimir Miloskovic. On 23 minutes Xewkija’s Darko Krstic entered Victoria’s area but had his effort well blocked by goalie Adrian Parnis. 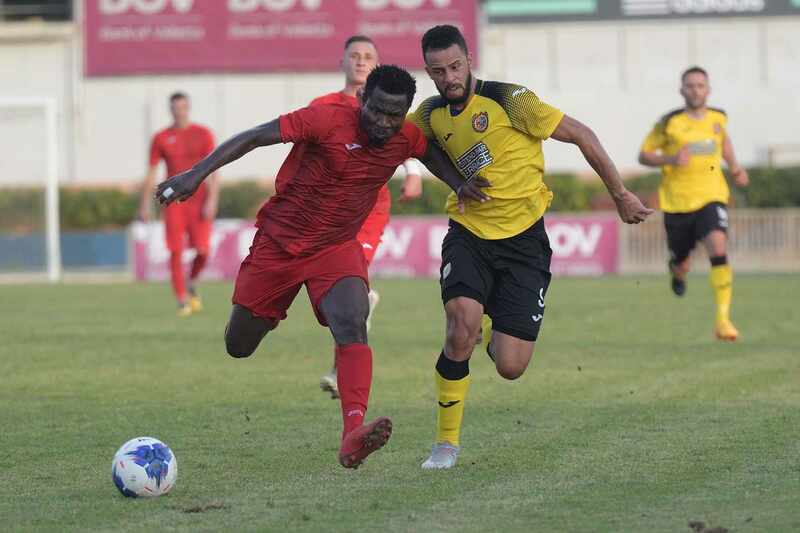 The Hotspurs were again dangerous on 35 minutes when Elton Da Silva entered the area with a personal action but his low shot was blocked by Xewkija’s defense. The Tigers opened the score in the following action when Darko Krstic as released inside Victoria’s territory and the striker lobbed over the goalkeeper as the latter left his area in an attempt to clear the danger. The Hotspurs were shocked and on 321 minutes Xewkija could have doubled the score when Claudio Antunes exchanged the ball that the edge of the area but the Brazilian striker had his attempt well blocked by goalie Adrian Parnis. Two minutes later Victoria’s Chris Camilleri had a shot on the run that missed the target and on 38 minutes Xewkija’s defender Manuel Tabone risked a lot to clear the ball off Elton Da Silva who was about to conclude towards goal from an ideal position. 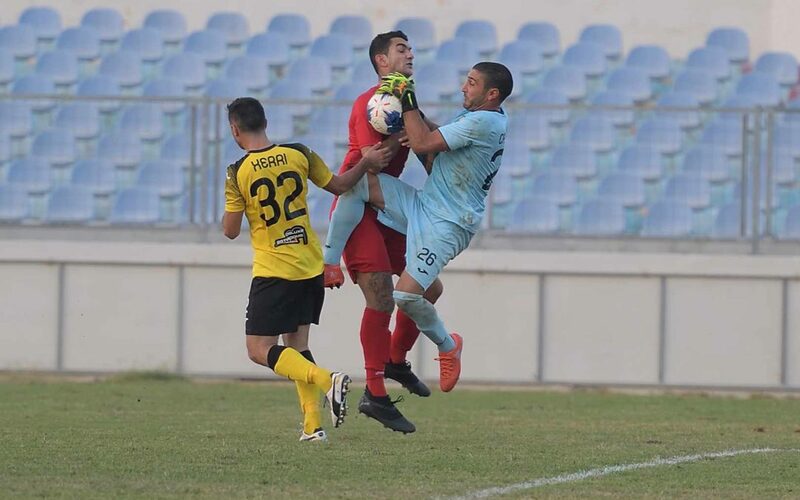 The Hotspurs tried to increase their pressure on Xewkija’s defense during the dying stages of the first half and on 40 minutes a strike by Elton Da Silva was well saved by Xewkija’s goalie. Three minutes later Victoria’s Emiliano Lattes had an attempt that ended just wide and just before half time Xewkija’s Daniel Bogdanovic had an effort directly from a free kick that missed the target. The Hotspurs came out more aggressive for the second period and on 48 minutes they could have levelled the score when Chris Camilleri entered Xewkija’s area from the left flank but his low inviting cross was concluded badly by Elton Da Silva and the ball ended on the side of the net. On 58 minutes Xewkija’s keeper saved to a corner a free kick by the same Da Silva. On 61 minutes Xewkija operated a fast break where Shaun Bajada released Darko Krstic who avoided the offside trap, entered the area and fired in goal. The Hotspurs lost composure and went all out in an attempt to re-open the issue. On 72 minutes a header by Elton Da Silva following a cross by Jonathan Bajada ended high and two minutes 0later a strike by Christian Mericeca missed the target. The Hotspurs lost an opportunity to take advantage of a bad clearance by the goalkeeper one minute later following a cross by Stanimir Miloskovic but Xewkija’s central defender Sergio Arturo Martinez Villa recovered in time and cleared the ball from an unattended goalmouth. The goalkeeper made up for his previous mistake on 83 minutes when he was well placed to save a low shot by substitute Andrew Mizzi and on 85 minutes Ferdinando Apap headed towards the goalmouth following a cross by Emiliano Lattes, the defense cleared badly and the same Apap took the ball but his shot was blocked by the defense. 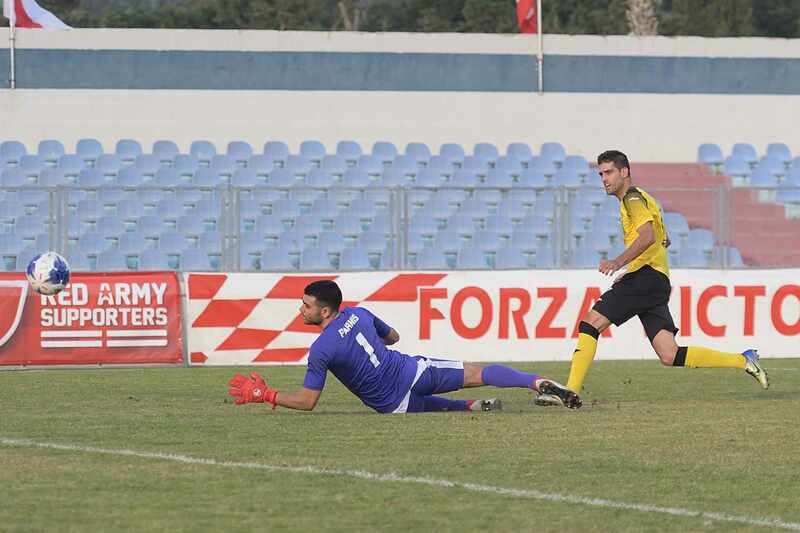 During the final minutes of the match Xewkija controlled play with more authority and could have scored the third goal in the sixth minute of stoppage time but a shot by Shaun Bajada following a counter break by Claudio Antunes was saved by goalie Adrian Parnis.